Fans at bus stops to cool you down? Cool! A six-month pilot scheme is under way to see if the wait at bus stops can be made cooler and more comfortable for commuters, even in Singapore's sweltering heat. Since last month, the Land Transport Authority (LTA) has been testing out the use of electric fans at five bus stops, and is studying the feasibility of installing them at others, The Straits Times has learnt. 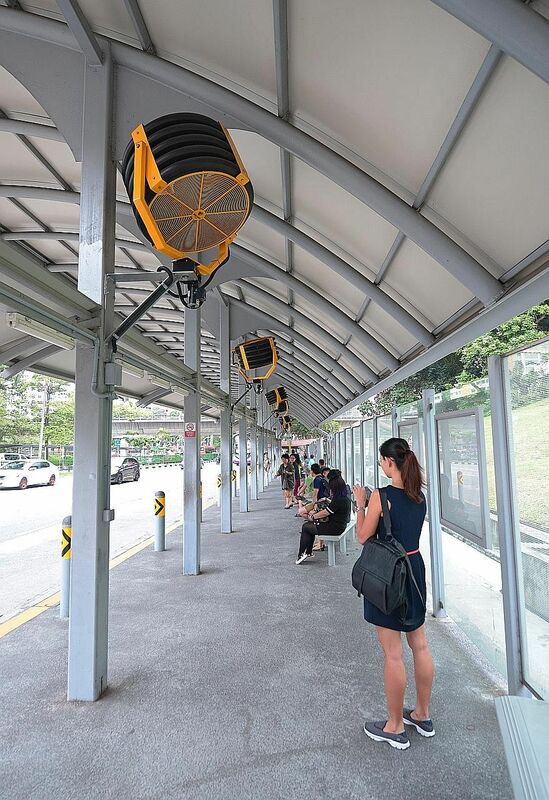 "The fans aim to improve ventilation at the bus stops and provide commuters who are waiting for their buses a reprieve from the heat," an LTA spokesman said in response to queries. Commuters can activate the fans using switches, and the devices will be powered to run for 15 minutes at a time. The bus stops with the fans can be found along Ang Mo Kio Avenue 3, near Ang Mo Kio MRT station; Block 270, Bukit Panjang Road; Serangoon Road near Tekka Centre; Block 302, Tampines Avenue 2; and Tiong Bahru Road, near Tiong Bahru Plaza. These bus stops were chosen for the pilot because of the higher levels of commuter traffic. It will help save electricity, especially when there are fewer people at the bus stop, like during the night. MADAM MARY GOH, a retiree, on how letting commuters decide when to switch on the fans is a good idea. Instead of switches, how about sensors which can detect people at the bus stops, so the fans turn on automatically? POLYTECHNIC STUDENT AWAD RUZAINI, on how use of the fans could be made more convenient for commuters. Bus stops of different heights were also taken into consideration, to test different types of fans, the LTA said. For example, at the high-roofed bus shelter along Ang Mo Kio Avenue 3, bladed oscillating fans are mounted on pillars to provide more coverage, while at the low-roofed bus stop in Tiong Bahru, linear-type fans are used instead. The LTA said the trial will be evaluated based on commuters' feedback on the effectiveness of the fans. The electric fans are part of the authority's ongoing efforts to improve the commuter experience at bus stops. In January, another trial was launched to improve the display of arrival timing boards, through the use of electronic paper (e-paper) technology. Such technology, which mimics the appearance of ink on paper - similar to e-readers such as the Amazon Kindle - is being tested out at information boards at 11 bus stops. As for the fans, commuters interviewed said they provide a welcome respite during the hot weather, or when the bus stops are crowded during peak periods. Madam Mary Goh, 60, a retiree, also pointed out that letting commuters decide when to switch on the fans is a good idea. "It will help save electricity, especially when there are fewer people at the bus stop, like during the night," she said in Mandarin. But polytechnic student Awad Ruzaini, 18, suggested automating the process. "Instead of switches, how about sensors which can detect people at the bus stops, so the fans turn on automatically," he said.